Six months on from TechCrunch editor Mike Arrington’s stated mission to create a “dead simple and dirt cheap touch screen web tablet to surf the web” and the first fully working prototype has been unveiled. 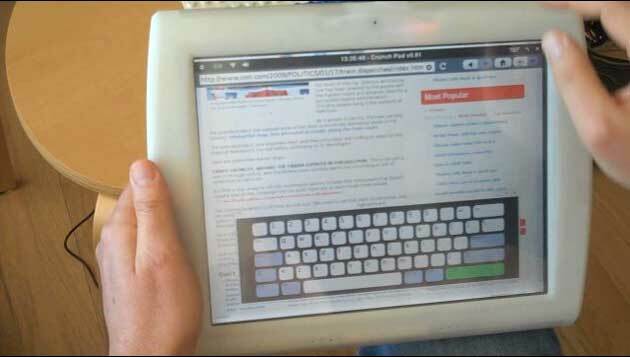 The device, which is now being called the ‘CrunchPad’, sports a 12 inch resistive 4:3 touchscreen, Via processor and 4GB of storage, virtual on-screen keyboard and is powered by a version of Linux and a custom WebKit browser. It’s primary use is for surfing the web, perhaps while watching TV “so you can look up stuff on Wikipedia or IMDB as you channel surf”, writes Arrington. Or as another means to consume online video (“on Hulu or Joost or wherever”) and other content, as well as check email or access other web services such as Google Docs. See also: How do you use your Netbook? In other words, just like existing Netbooks, the CrunchPad is designed for the Cloud, in which our data and applications increasingly reside on remote servers, accessible through a standard web browser. That raises the question: why not just buy a Netbook, which can cost the same (the CrunchPad’s target price has risen from 200 to 300 dollars) and provide a more traditional clam-shell form factor and near full size physical QWERTY keyboard. (Since TechCrunch first touted its web tablet idea, many more companies have entered the increasingly competitive Netbook space — see Don’t buy a Netbook pleads PC industry). Many will answer that a tablet form factor is more appealing and point to the popularity of Apple’s iPod touch, whose limited screen size the CrunchPad hopes to address. However, while the Netbook versus CrunchPad tablet form factor is an interesting question, it maybe largely academic. Arrington concedes that his device may never make it to production. The real question for us is whether this project has legs and should go forward towards production units, which is a very big step from a working prototype. That would require spinning the company off from the blog and building a team.. It’s a decision we haven’t made yet. My take: TechCrunch doesn’t need to get into the hardware game in order to deliver a device with Arrington’s preferred form factor and stated purpose. At CES earlier this month we already saw how Netbooks are beginning to experiment with new form factors, including tablet incarnations, as well as Android powered devices that resemble a similar vision to the CrunchPad. Having said that, from a commercial perspective, if Arrington and co. can find a hardware partner to do most of the heavy lifting – finish the design, manufacture, retail and support – then licensing the ‘Crunch’ brand to help differentiate the device from a plethora of likely competitors could be a profitable and smart move. 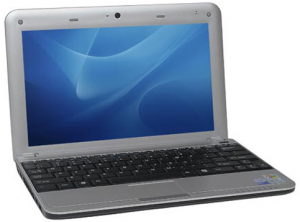 Will Apple's 'Netbook' be open or closed?